Fabrication Techniques: Die Cutting, Hot wire (different products), Hot plate lamination, Lamination (foam to foam, cardboard, Paper, etc...), Custom made wood crates, Corrugated boxes. Some of our materials are certified to the Coalition of Northeast Governors (CONEG) for heavy metal content. We meet Federal Specifications. All our foams are CFC/HCFC free. All of our foams are Recyclable. At Foam Products, We keep large inventories, so we are able to quickly respond to your needs. We have the know how - We have the experience - We could do it ! Let us work on your next packaging design. 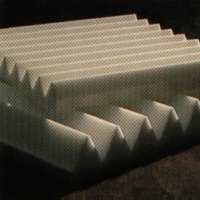 At Foam Products, we design the most efficient way considering cost, space and functionality.